This post may contain affiliate links. Your cost is the same but it helps support this site and the fun freebies we share. See our full disclosures here. If you’ve been following along, you’ve probably noticed I have shared a lot of yummy dessert recipes lately. Today I am going to share the queen of all desserts. It’s a two-for-one! 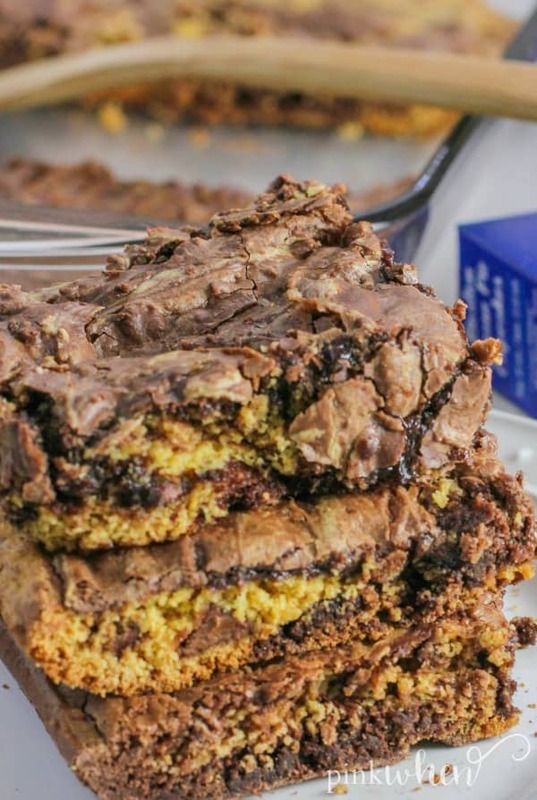 These Cake Mix Cookie Bars taste like a cookie and a brownie, all rolled into one. You are going to love every single bite! When I was younger, my mom always made the most delicious cakes for us. She made cakes whether it was a birthday, a holiday, or just because. We loved all of her cool designs and her fun recipes. It was always a treat to see what mom was going to come up with next! Fast forward a few (or maybe a LOT more than a few 🙂 ) years later and I am just like mom. I love to create fun dessert recipes for the family. And just like mom, I don’t need a special occasion to make one. One of my favorite desserts to make are delicious cake mix recipes. 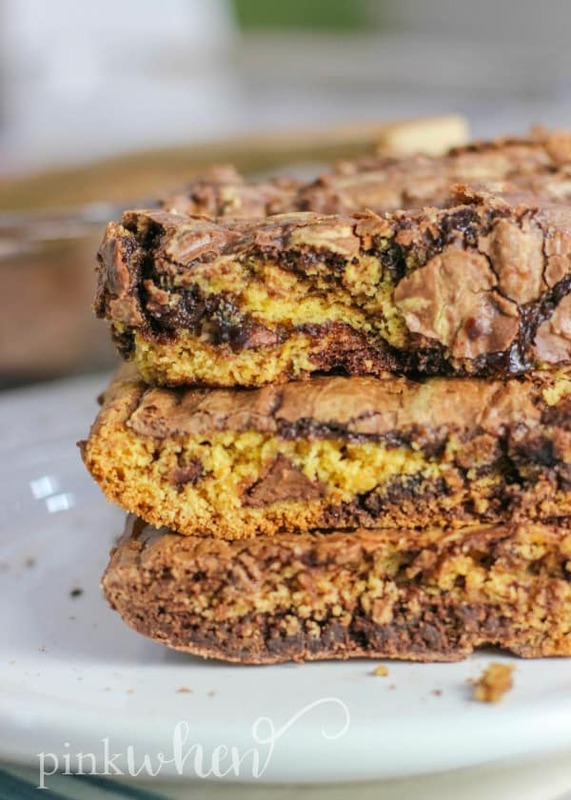 I love to make cake mix cookies and cake mix cookie bars because they are super easy to create. Not only that, but the sky is the limit when it comes to what kind of dessert or flavor you want to make. There are so many options! I love yellow cake mix recipes, and one of my favorite things to do is create fun yellow cake mix recipes with the kids. I love to start the base of my dessert with a yellow cake mix and then create something delightful from there. In fact, my kids have come to realize that they can ask for almost any fun dessert bar or cookie and I can create it with a yellow cake mix. Today’s dessert is no exception! It will be another fun idea to add to your yellow cake mix recipes collection. There are a few reasons why I love this recipe so much. It only takes 5 ingredients AND it only takes around 35 minutes from start to finish. 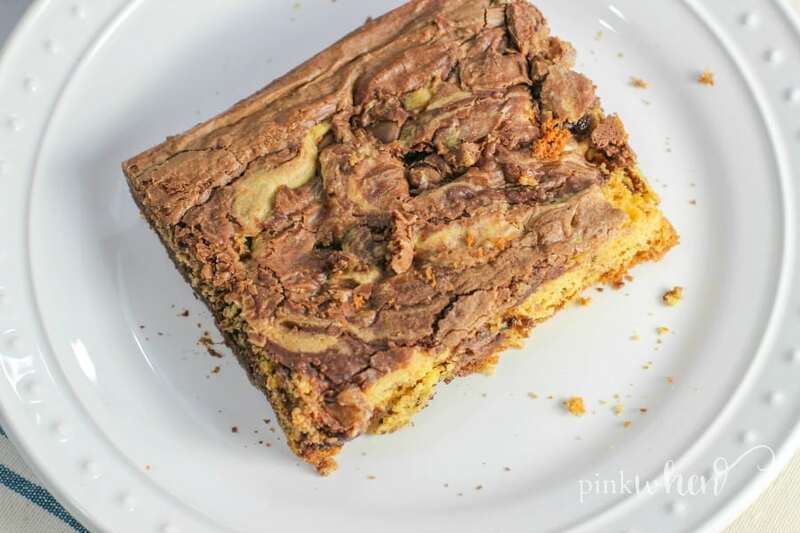 Oh…and it’s a delicious cake mix cookie bar with a little brownie twist. 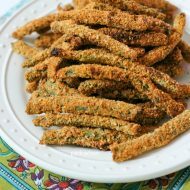 Plus, my kiddos love to join me in the kitchen to make this recipe because it is SO EASY to make. It’s a perfect recipe for summertime baking with the kids. Make sure you check out my step by step video below! Once you have grabbed all of your supplies, it’s time to make the best dessert ever. Grab some extra aprons and let the kids join you in the kitchen. Heat the oven to 350 degrees. Prepare (1) 9 x 13 and (1)8 x 8 baking dishes and set them aside. In a medium mixing bowl, add 2 eggs, 1/3 cup olive oil, and cake mix. Mix well. Add in the chocolate chips. 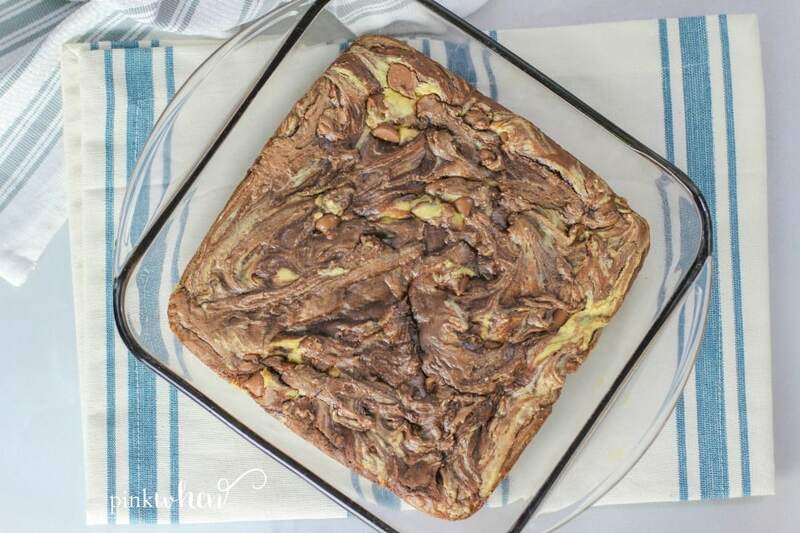 In a separate mixing bowl add 2 eggs, 1/3 cup olive oil, and brownie mix. Mix well. Take half of the cake mixture and half of the brownie mixture and swirl them together in the baking dish. Both mixtures will be thick but be patient and mix them well. Place in the oven for 30-35 minutes or until fully cooked. Allow to cool slightly before cutting and serving. Remaining bars will store easily in an air tight container. Add this dessert to your list of yellow cake mix recipes to make! It’s going to be a new favorite for sure, and the kids will love summertime baking even more when you make this recipe together! 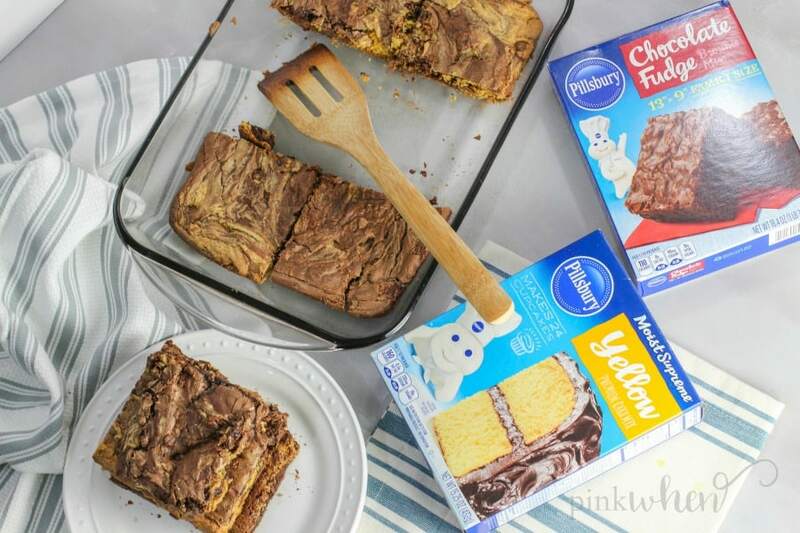 You can easily find all of your favorite Pillsbury mixes in the baking aisle at your local Kroger store. 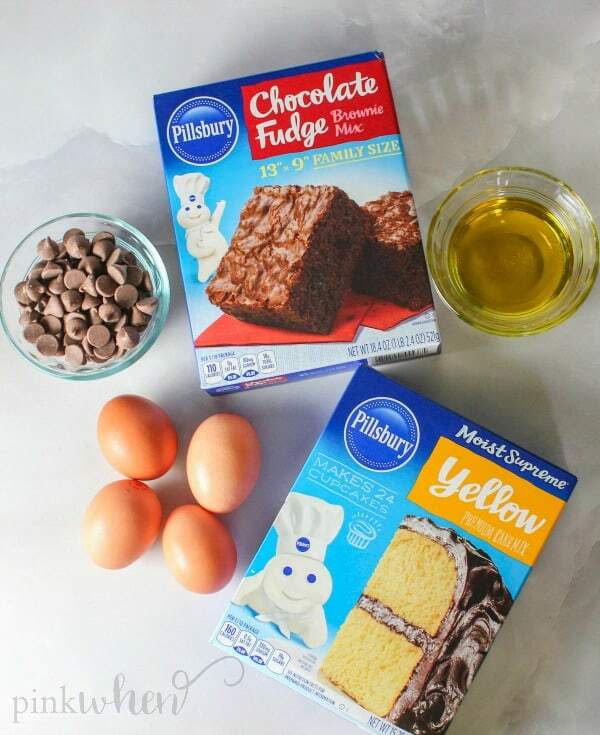 And check out the Pillsbury brand page on Myxxrecipes.com for more inspiration! Have you made this? Rate our recipe below! Print the recipe, rate it, and learn more about PinkWhen! 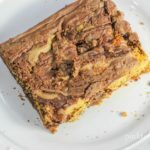 These delicious cake mix cookie bars are the perfect summertime treat and baking recipe for the you and the kids. Heat the oven to 350. Prepare (1) 9 x 13 and (1) 8 x 8 baking dishes and set them aside. Take half of the cake mixture and half of the brownie mixture and swirl them together in the baking dish. Both mixtures will be thick but be patient and mix them well. Do this for both dishes. Place in the oven for 20-25 minutes or until fully cooked. Allow to cool slightly before cutting and serving. **Nutrition facts are based on my best estimation for this recipe. They may not be accurate depending on what brands you use or modifications you might make to the recipe. For most accurate calculations, I recommend using a nutrition calculator with the exact brands and measurements you use with the recipe. 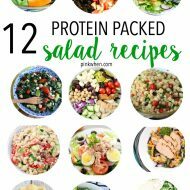 ©PinkWhen - Sign up for more quick and easy recipes here!! Did you make this recipe? Or planning to?Share a photo, mention @pinkwhenjen, and tag #pinkwhen on Instagram and in your Instagram Story. 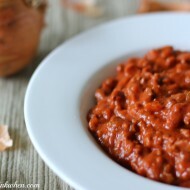 Don't forget to RATE this recipe once you've made it! !